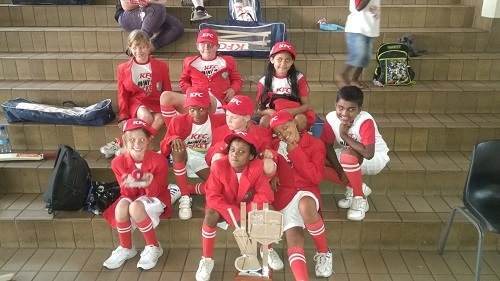 In sweltering heat, the KFC Mini-Cricket team from Laerskool Fleur hosted the Proteas in the 6th match of the Kids vs. Proteas series. A vociferous crowd packed the stadium as the Proteas were promised a hostile environment. The early cheers were deafening as the crowd welcomed International hero Kagiso Makau, captain of the Mini-Cricket side. There was also warm applause for the Protea’s captain, AB de Villiers. After a brief pitch inspection showed the possibility of inconsistent bounce and a very slow outfield, the teams were led in the toss by commentating legend Neal Manthorp. The Laerskool Fleur team won the toss and with the confidence of leading his side, Kagiso chose to bowl as “we are good at bowling”, which was helped by knowing his team could call on Tamryn Lorence, Vanya van Wyngaardt and Lincoln Vry. There was disappointment in the Proteas squad as they were unable to call on the ladies to bolster the line up, they were however able to call upon 3 imports from the Laerskool Fleur academy of cricket, namely Mitayia Naidoo, Oatlegile Mashilo and Craig Williams. After all the excitement in the build up, the game was finally ready to go. The Proteas started slow with AB de Villiers and new opener Aaron Phangiso playing for the singles. AB then opened up a bit on a difficult pitch, but a highly disciplined bowling performance restricted the Worlds leading batsmen to a paltry total. The pressure was starting to build on the Proteas with good fielding and accurate throws. 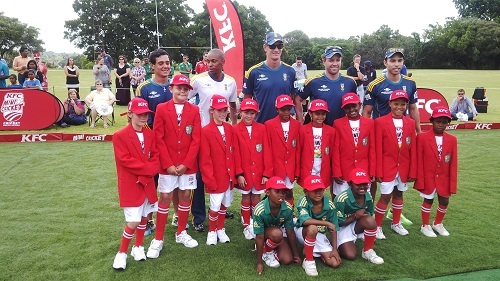 Chris Morris, Ferhaan Berhardien and Quinton de Kock were all kept at bay with discipline swing and blockhole bowling especially from Kagiso, Mikaylen Naidoo and Tylo van Wyngaardt. The Proteas eventually managed a respectable score after healthy knocks from the Academy players. The Proteas finished on 56 off their allotted 8 overs, not their best total of the series, but a total that was defendable. The highlight of the innings was however Laerskool Fleur with their leading bowler bagging 3/3 in her allotted one over. 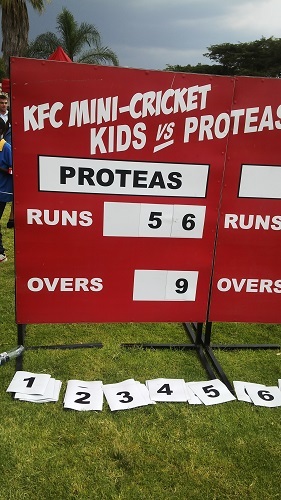 With the dark clouds looming, the KFC Mini Cricket side set about their task of staying ahead of the Duckworth Lewis rate, but were ably assisted by the Proteas bowlers struggling to find consistency with their bowling and fielding. Some fine batting by Michael Atkinson and Alex Gobashane kept the game close. As the lightning proceeded to near closer to the ground, the umpire made an important call for safety and called the game off. The Proteas had lost by one run on the Duckworth Lewis method. Of course after the brilliance of the match, a disappointed AB De Villiers had to face the media, but admitted that they had been outplayed by the better team. The player of the match was Tylo van Wyngaardt whose spell of bowling led to the strangehold of the Proteas innings. The victory meant that the Proteas now only hold a one match lead with 2 to play in the series. Anyone can still win. After all was said and done the five Proteas signed countless autographs, smiled for numerous photos and shared in some KFC with the hordes of fans in attendance. It was a lot of fun for the players, the fans and the Proteas. it was a fantastic afternoon. Only pity was the rain. Well done boys.